Suitable for hard material films, lacquers, plastic coatings etc. Quality assurance of coatings needs expressive test procedures, which allow quick and reliable valuation of the coating quality. The Calotest device kaloMAX NT II has been developed in co-operation with the Fraunhofer Institut for Surface Engineering and Thin Films (IST) especially for the charcterization of hard coatings. The method is usable for thin coatings (1 µm) as well as for the materials or lacquers. The procedure supplies a material charcteristic which enables a function-orientd evaluation of the coating quality. 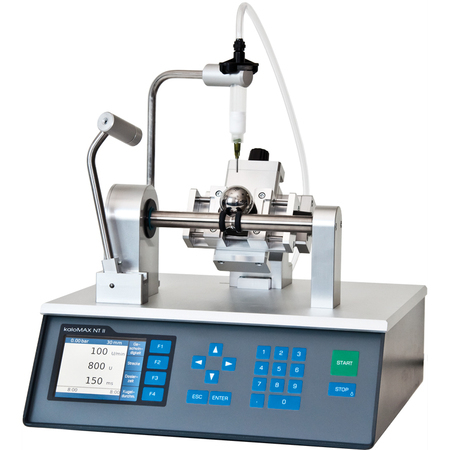 Programmable Grinding path, grinding period, number of revolutions, dosage time etc.